Competition and tracksuits were a re-occuring theme in many of the conversations and project ideas that were decamped at Caravansarai over the years. 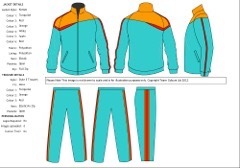 Inspired by the wide range of track suits available in the Eminönü area of Istanbul, despite the almost complete lack of any sports culture in Turkey, we wanted very much to have own Team Caravansarai track suits. Alas, it was not meant to be, though we did make ourselves a logo and design our dream track suits.